The Fleetwood-Knott End ferry and two kayakers helped with the rescue operation along with RNLI, coastguards and Lancashire Fire and Rescue Service. 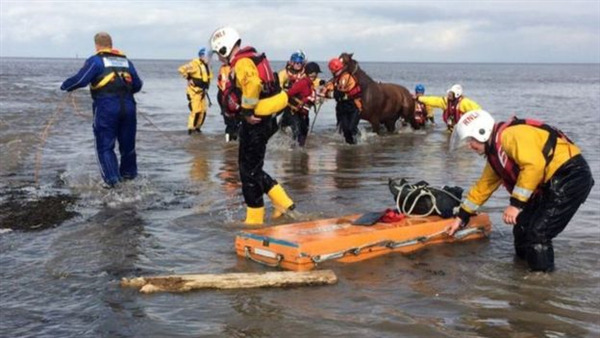 HM Coastguard Fleetwood said the horses were rescued "in the nick of time". The coastguard said on its Facebook page the ferry to transport the rescue team over the river "saving a good 30 minute dash". It added: "After a huge effort both horses were saved from drowning. Excellent multi agency teamwork, 2 relieved riders and 2 very excited horses when they were reunited." One of the coastguards said: "I will be shouting the horses name in my sleep tonight. It was unbelievable the sound both horses made when they met afterwards they were very pleased to see each other to say the least." Lancashire Fire and Rescue Service warned of the dangers of the riding by the edge of the water. It said: "We don't want anyone going riding out there because it's extremely soft sand." Sue Carr who said her daughter owns one of the horses thanked emergency services involved in the rescue on Facebook. She said: "Can't thank you enough. We were so terrified. That horse is my daughter's baby. Endlessly in your debt."